All bricks absorb at least a small amount of water, when the water inside the brick freezes the face of the brick can often be damaged. This is called spalling. Once this happens the wall is no longer waterproof as moisture can penetrate through the porous brick. Using a club hammer and chisel gently remove the mortar surrounding the damaged brick. To speed things up you can drill several small holes in the mortar and the brick to help it break up more easily. Once you have remove the brick cleanup the opening and dampen both it and the surrounding bricks so much are is not absorbed from the new mortar. Dampen the replacement brick and apply mortar to the bottom and sides of the opening. 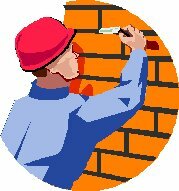 When replacing a single brick it is best to put mortar on the bottom and one side of the hole, and then add mortar to the top and opposite side of the brick. Slot in the new brick and cleanup any excess mortar. Make sure the joints are full of mortar and then use a trowel to point first the vertical joints and then the horizontal joints. The mortar should form a continuous band across the brick and be angled to allow moisture to run off. There are three types of horizontal joints, flush, keyed and weatherstruck. Flush joints are created by filling the joints, allowing it to harden slightly and then rubbing down until it is flush with the brick. Keyed joints can be achieved by pressing a piece of hose or similar tube along the joints whilst the mortar is still wet. Weatherstruck joints are sloped to allow rainwater to drain off. Vertical joints are sloped to one side and horizontal joints are sloped so the brick above overhangs the joint. Finally, cleanup any excess mortar and wash down the wall to remove any stains. Stubborn mortar stains can be hidden by rubbing them with an old brick. Brick and block sizes and how to calculate quantity required to complete your project.